Some 80 per cent of Gulf Extrusions’ output goes to the construction sector. 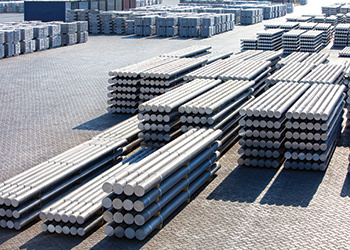 Gulf Extrusions, one of the largest aluminium product makers in the Gulf, is expanding its production capacity and its product range in line with the anticipated growth in its business. The UAE-based aluminium extruder witnessed 10 per cent growth in business during the first half of this year compared to the same period last year. “We have seen steady year-on-year growth over the past few years,” said Ihab Mouallem, commercial director of Gulf Extrusions. Gulf Extrusions, a member of Metals Industries – Al Ghurair Group, produces aluminium extruded profiles ranging from architectural, industrial and automotive sections to furniture, marine applications, transportation, and customised products. According to Mouallem, 2014 was a “phenomenal year” for the company as it registered 25 per cent growth over 2013. “The growth came from both the local as well as from export markets,” he says, adding that its exports go all over the globe. “The local market contributes to around 60 per of our business and nearly 80 per cent of our production goes to the construction sector. Locally, we have experienced growth from the architectural sector,” he adds. In the GCC, its major markets are the UAE, Saudi Arabia and Qatar where the construction sector is buoyant. To cater to the growing demand for its products, Gulf Extrusions has embarked on increasing its production capacity by 50 per cent. “Our current capacity is 50,000 tonnes and we crossed 90 per cent of the capacity last year. We are adding additional capacity of around 22,000 tonnes before the end of this year,” he says. Among Gulf Extrusions’ recent innovations are what is claimed to be the region’s first locally designed fire-rated aluminium door system. “Fire-X87 is the first system in aluminium as most of the existing systems in the market are in steel,” Mouallem points out. With a fire rating integrity of 90 minutes, the company’s fire-resistant door has been proven to significantly reduce fire risk and promote higher levels of safety and security, he says adding that the fire test indicates the company’s commitment to providing high quality products that keep customers safe. The company has also introduced a new thermal break system for sliding windows called TB105. “The product is economical and effective in reducing heat transfer and is in line with the UAE’s move towards sustainability. We already have a very high-end system called Montana which has a good market share in the UAE and Qatar, and now we have come up with a system that has the same features as thermal-break insulating systems but is an economical version. “It is cheaper to fabricate as the materials used are more economical and meets the local and green building regulations. “Designing such systems comes in response to market requirements – there is a demand for mid-range doors and window systems,” he says. Gulf Extrusions possesses a wide database of European customers. The company has been certified to ISO 9001:2008, ISO14001:2004 and ISO/TS 16949:2009 standards as well as to Ohsas (Occupation Health and Safety Assurance Series) in August 2014, in addition to having a full range of specialised certificates. It also was the first extrusion company in the GCC to receive the Emirates Quality Mark certification from the Emirates Authority for Standardisation and Metrology as well as a certificate of appreciation from the Dubai Quality Group. 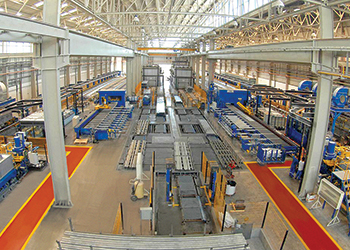 Gulf Extrusions ... increasing its production capacity by 50 per cent. Over the years, the company has been associated with a number of projects. “We have been involved with 90 to 95 per cent of the projects here as most of the materials are extruded at our factory because of the complexity and technology needed to manufacture the products,” Mouallem says. One such project is the Opus in Dubai, a mixed-use tower designed by Zaha Hadid. Developed by Omniyat Properties, the tower is cube-like and seems to hover above the ground. Although comprising three separate towers, the building appears as a unified whole, with a distinctive space through the centre, which has been dubbed the void. Gulf Extrusions is doing the special aluminium glazed façade for the project. Another interesting project is the King Abdul Aziz International Airport in Jeddah, Saudi Arabia, featuring a twisted profile. To produce the profile, the company developed a special machine to carry out the 60-degree twisting for a length of 6 m. The twisted profile from Gulf Extrusions was selected as the most innovative aluminium product at Aluminium 2014, a prestigious aluminium event held in Dusseldorf, Germany. Gulf Extrusions has developed a new website and is in the process of launching a CRM (customer relationship management) system. “It will be available to all our customers. Basically, all information required will be available online,” Mouallem concludes.